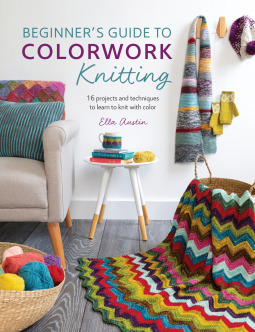 This book would be great for the knitter wanting to jump into colorwork as well as the more seasoned knitter looking to try something new. Projects begin simply with stripes, only requiring the changing of yarn to create the colorwork. As the reader progresses through the book, the difficulty of the projects increases allowing the knitter to build on their skills. Colorwork directions are written as well as charted. Other knitting skills can be built as well through the projects, such as steeking with the Steeked Mug Cozy. New skills needed are clearly illustrated in writing as well as through the accompanying photos. The 16 projects cover all the basics of colorwork including stripes, slipped stitches, stranded colorwork, intarsia, double knitting, modular knitting and entrelac along with a lesson on color theory. This is a great introduction to colorwork! Thank you to F+W Media and NetGalley for the opportunity to read this book in exchange for my honest review.